Genetics aren't the only thing that can determine a child's characteristics, but the children in these striking photo pairings prove that their ability to define a family's appearance over the course of several generations can be irresistible. In these families, a comparison between a child and their parents or even grand-parents at the same age prove that sometimes, it's all in the genes! If you've got some childhood photos of your parents or grandparents that look just like you, we'd love to see the comparison! Just edit them side-by-side and add them to this list. freaky!! This is a time traveler!! Wow... he even has his Dad's vest!! Oh my god this one is crazy! They are identical! Daughter looks like a combo of both grandmother and mother. It's odd they have the same teeth! Ha ha this picture is so cute it cracks me up! #23 Father And Son. Same Age, Same Shirt. #26 Father And Son ... 10 Years Old. He looks as if he is holding a picture of himself! Just amazing. Wow! Same exact expression and pose!! So is this father holding him and then him holding his son? Both have their trusty wheels behind them. Beautiful girls in both generations. How is this not the #1 pic!? Just amazing. 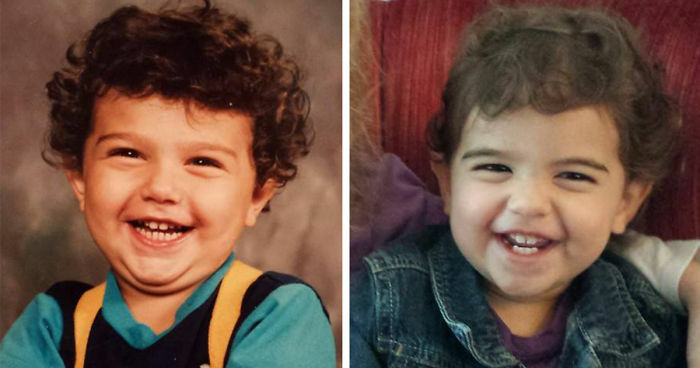 OMG- those faces are exactly the same, that's eerie! #83 Mother And Son, Both At Around 14.